Photo Provided Former State Senate President Jeff Kessler of Glen Dale files to run for the state Supreme Court. 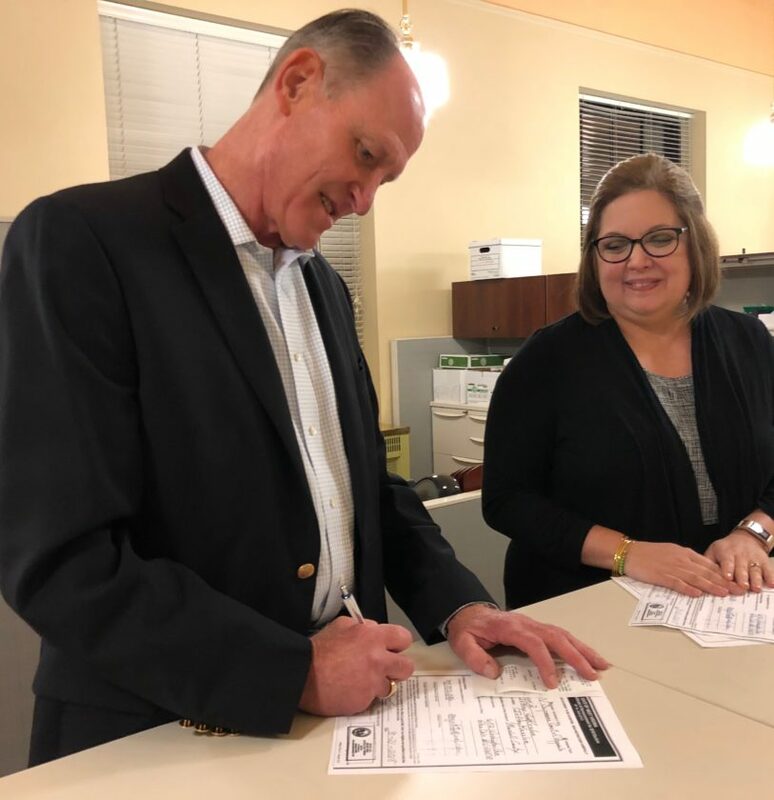 VCHARLESTON – The races to replace former West Virginia Supreme Court justices Menis Ketchum and Robin Davis are packed fields, with newly filed candidates including former state Senate President Jeff Kessler, of Glen Dale. In addition, a Wheeling attorney, Jim O’Brien, has filed. By the deadline last night to file for the posts, to be filled in the Nov. 6 election, 20 people had formally declared their candidacies for the two high court openings, according to Secretary of State Mac Warner’s office. By the midnight deadline, 10 filed for division 1, the winner of which will fill the remaining two years left on Ketchum’s 12-year term. Another 10 filed for division 2, with the winner filling the remaining six years on Davis’s second 12-year term. The election ballot will have two categories for the Supreme Court positions, divisions 1 and 2. Both Kessler and O’Brien filed for division 2. Kessler is a 1981 graduate of the West Virginia University College of Law. He is the founding partner of the Berry, Kessler, Crutchfield, Taylor, and Gordon law firm in Moundsville. He was appointed to the Senate in 1997 and won election in 1998. He was chosen president in 2010 and served until the Republican takeover in 2014. Instead of running for re-election in 2016, he ran for the Democratic Party nomination for governor, losing to Gov. Jim Justice. O’Brien is a founding partner of Hartley and O’Brien in Wheeling, O’Brien is a 1981 graduate of the WVU College of Law. Before starting his own firm, O’Brien worked as an assistant U.S. Attorney and a law clerk at the U.S. District Court in Parkersburg. – Former House Speaker Tim Armstead. The 20-year member of the West Virginia House of Delegates resigned noon Tuesday as speaker and filed for the seat shortly afterward. Armstead most recently was an attorney in the natural gas industry. He was elected speaker in 2014 after Republicans took the majority in the House. “I hope that the people of our state will give me the opportunity to serve them again in the West Virginia Supreme Court of Appeals,” Armstead said in a statement. – Ronald Hatfield of Huntington. Hatfield is the local managing partner for Litchfield Cavo in Barboursville. He is a 2000 graduate of the WVU College of Law. His focus is commercial and business law. Hatfield also is a veteran of the U.S. Marine Corps. – 23rd Circuit Court Judge Chris Wilkes. A 1982 graduate of the Ohio Northern University Pettit College of Law, he was a partner in his own law firm until 1993, when he was elected to the 23rd Judicial Circuit, serving Berkeley, Jefferson and Morgan counties. – Hiram Lewis of Procious. Lewis is a 2001 graduate of the WVU Law School, a 2004 candidate for West Virginia Attorney General and a 2006 candidate for U.S. Senate. He retired from the West Virginia National Guard in 2010. According to media reports, Lewis was acquitted in 2013 of malicious wounding and domestic assault for shooting a person who claimed to live with Lewis. Other candidates for division 1 include: Harry Bruner, Jr. of Charleston; Robert Carlton of Williamson; Carl Hostler of Scott Depot; D.C. Offutt Jr. of Barboursville; Jeff Woods of Nitro; and 13th Circuit Court Judge Joanna Tabit of Charleston. – 11th Family Circuit Court Judge Jim Douglas. He is a 1977 graduate of the West Virginia University College of Law. He had his own law practice until being elected to the 11th family court circuit in 2016. “I think it is past time and high time that we have a Justice on the West Virginia Supreme Court of Appeals who, as a lawyer, has had substantial down-to-earth, day-to-day, get-your-hands-dirty, realistic experience,” Douglas said. – Robert Frank of Lewisburg. Born in Turkey, he is a 1990 graduate of the University of Iowa College of Law and has practiced law in West Virginia since 2008. His area of focus is personal injury. Other candidates for division 2 include: Republican Congressman Evan Jenkins of Huntington; William Schwartz of Charleston; Dennise Smith of Charleston; Brenden Long of Hurricane; Marty Sheehan of Wheeling; and 25th Circuit Court Judge William Thompson of Madison. Additional candidates could be added if their certificates of candidacy were mailed and postmarked by Tuesday. Ketchum resigned July 27 shortly before the House Judiciary Committee began impeachment proceedings. He agreed to plead guilty in a federal information to one count of wire fraud. A federal judge will hear that plea agreement on Thursday, Aug. 23. The full house voted adopted 11 articles of impeachment on August 13 against justices Davis, Allen Loughry, Margaret Workman, and Beth Walker. Davis announced her resignation from the court the next day after the house returned three articles of impeachment against her, including over payment of senior status judges, spending $500,000 on her office renovations, and for lack of policies and procedures in controlling spending. Voters will be able to choose which candidate will serve for the remainder of Ketchum and Davis’ terms, but Justice will still need to make appointments in time for the start of the Supreme Court’s Sept. 5 docket of cases. The Judicial Vacancy Advisory Commission has announced the applicants for the vacated seats, including Jenkins, Armstead, Carlton, Frank, Offutt, Schwartz and Sheehan. Also named as possible appointees were Charleston attorney Gregory Chiartas, and Clay attorney Arthur King. The West Virginia Senate met Monday to approve rules for the upcoming impeachment trial for the remaining justices – Loughry, Workman, and Walker. If one or more are convicted and removed from office, Justice will have to again appoint replacements who would serve until a special election could be held in 2020. The Senate returns Sept. 11 for a pre-trial motion hearing, which will be presided over by acting Chief Justice Paul Farrell.